Daycare Was So Much Fun! Hi friends. I just arrived home from daycare. I started running from the second I arrived. My mom removed my harness so that she could take off my sweater (it was FREEZING COLD today) and I ran in circles all over the lobby. I’m free, I’m free, I’m free, I’m dizzy! Mom and Andrew, who works at the Registration desk, corralled me and Andrew carried me to the play area. Mom said I could stay for full – day daycare. I ran and played and made friends and then it was time for lunch. I love going to daycare. They feed me lunch and now I know what it is. After lunch we all hung out until it was time to go back to the play area. I LOVE napping on mom’s shoulder! 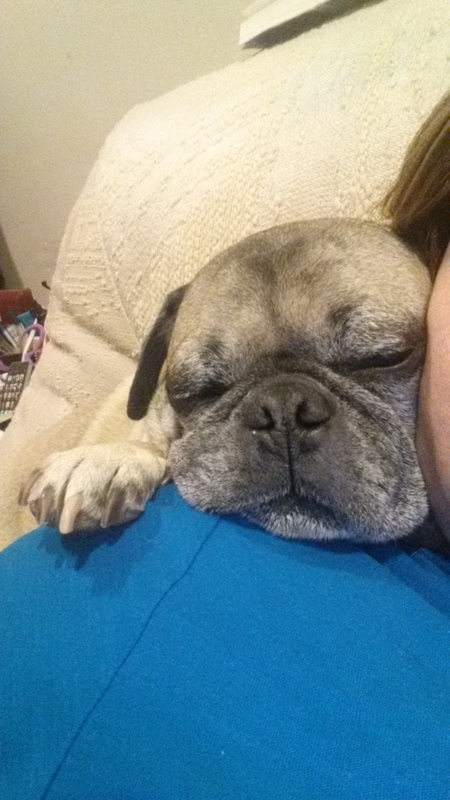 Pugsley your adorable – hope to see you soon!! !